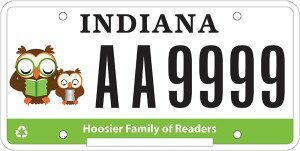 Put your money back into your local school district with the purchase of the Hoosier Family Readers license plate. Purchasing this education license plate in Indiana supports your public schools. Nearly $19 of the specialty plate’s administration fee is sent to your selected school’s education foundation. The Foundation for Monroe County Community Schools (FMCCS) puts this money back into our classrooms through our Grants to Equip, Inspire, & Innovate program. When you renew your license plate, please consider supporting FMCCS. Your support does Make a Difference.